Looks like someone "Plum Sweet" is in Joan's family! 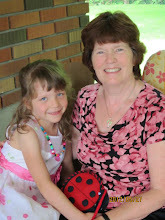 Joan you best get busy, I know that sweet girl needs al alphabet quilt! E-mail me at with your address and I will ship out the fabric to you. Below are some pictures of our new Nashville market releases. English Garden is our limited edition kit. This sewing bag kit also included fabric from our newest Plum Sweet line. The Garden Fair is a kit that Hoffman Dist.packaged and sold at market for us. All of the floss needed for this project is included. Your local cross stitch shop can be purchase this from them. This box is just the right size for my garden seeds. All I need is a bit of warm weather to plant them. 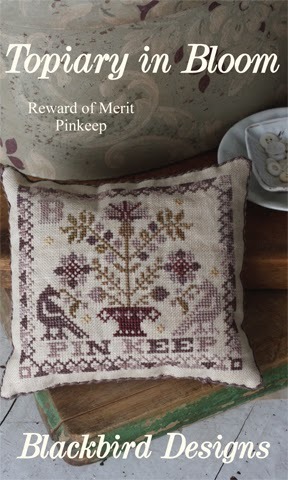 Topiary In Bloom is the newest pattern in our Reward of Merit series. The colors of this go well with the English Garden sewing bag. 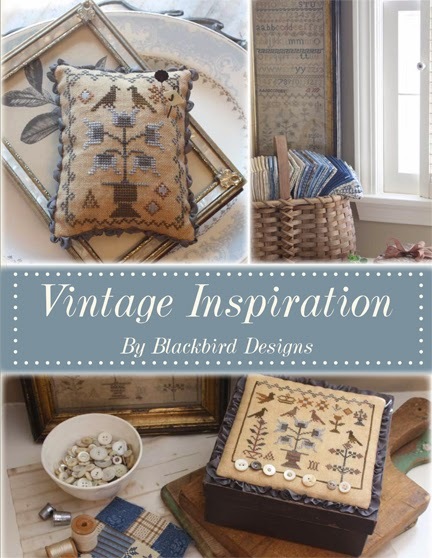 The vintage sampler above is one of my favorites. I am attracted to antique and vintage samplers just as I am drawn to old, worn books. Each has a tale to tell, each has something that catches the eye. Sweet borders combined with bird motifs at the bottom of the piece struck my fancy, as did the letters and numbers, separated by dividing bands. But those features are not what made me purchase this sampler. Rather, it was the bright scarlet initials in the middle of the piece that popped out at me and made me get out my checkbook. Those initials matched mine before I married. I will probably never know the name of the girl who toiled over this sampler. For, just as finding the last pages of a book missing, that part of the story was separated from her work. 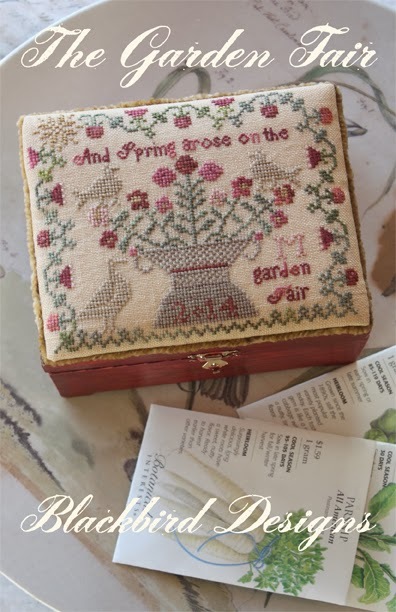 The booklet below has the pattern for the large sampler, the pincushion and sewing box. Many thanks to all who participated in the contest! Hope you all had a chance to visit all of the blogs and get all of the patterns for the Alphabet Quilt! Congrats to Joan! 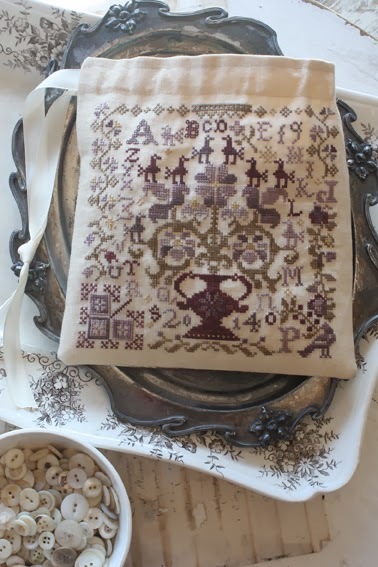 That is a beautiful antique sampler! Yes, congratulations to Joan for a great win. Missouri Star had Plum Sweet jelly roll on a special and of course one is on the way to me. Love the sampler and I too, am always on the hunt for Ls - I usually find more Ps but would also take G my maiden initial. Garden Fair is beautiful also - I always look forward to a post from you!! 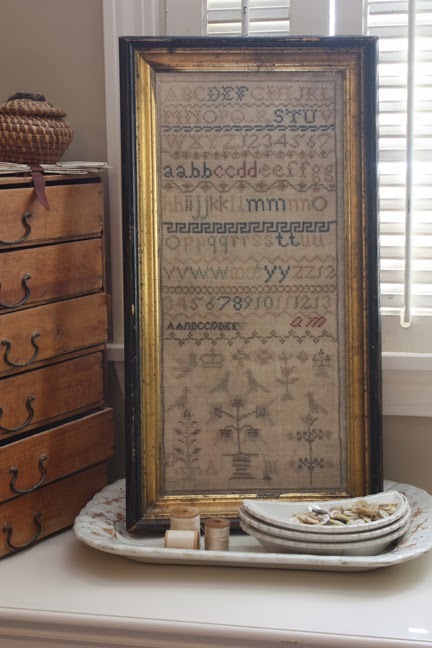 Everything is simply gorgeous and the vintage sampler with that perfect frame...waw!!! Beautiful! I had to buy them all : ) Congratulations to Joan! Just beautiful, love them all! I will grow old trying to get all of them done along with the others I have.....a good problem to have. Congratulations to Joan ! By the way, I have a question about the lovely English garden that I cannot find anymore. If by any chance you know where there is one left, I am interested :-) Thanks a lot. Berangere from Belgium. I'm not sure which shops still have the kit. Let me do a blog posting to find out any shops that still have the kit. Might you be talking about the above sampler the very old one. I really like and wonder what book can I get a copy of it? Will there be a Easter design for the seasonal series for the black box? There won't be an Easter one for this year. Great idea though! I can see a cute bunny or basket of eggs on the top of the sewing box. We are thinking of a new one....just not sure the exact release date. Hopefully this summer. Hi Alma. I was going thru an old quilt box and found a picture of United Hearts Quilt using Higdon Camp. Is there somewhere where I can get the pattern? I love your Moda Fabric line. Moda made up a pattern with the heart design. They have been sold out for quite a while. I had made it in remembrance of those who lost their lives in 9-11. I'll look around and find the quilt. I can scan a block and send it to you. I won't be able to do it this week though. Hopefully next! I was going back through older blogs & remember that you & Barb had go to Paris on a wonderful trip. I found the photo of the cross stitch that had a wonderful time in shopping. Could you send me the name & also do they ship. What a wonderful trip we had! The shop is lovely and so much fun. The woman working there that day didn't speak English, but it didn't stop her from being able to help us. 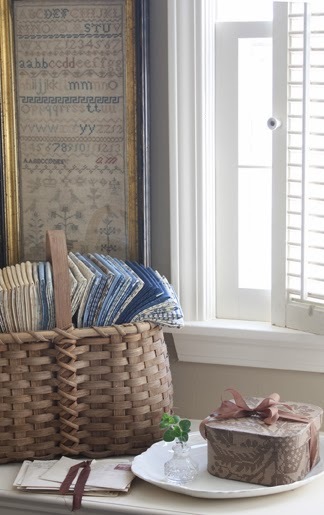 Love of cross stitch was the common language. Below is posted a website for them. They have a blog too. But it looks like everything is in French. You can copy the French text and paste it into Google Translate to get an idea of what they are writing about. I looked for a translate tab on their site but didn't find it at first glance. Maybe you will be able to find it. So lovely blog you have! Hello!!! 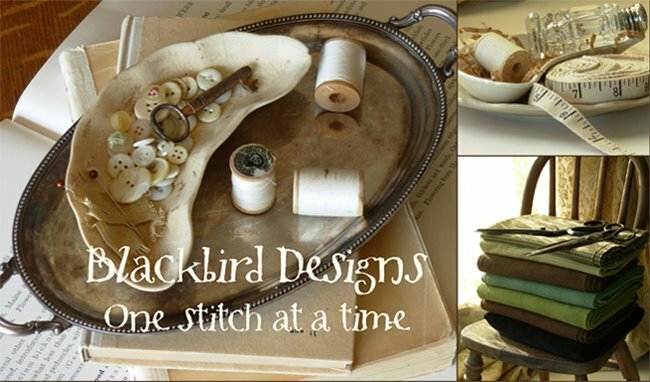 one of my passions is stitch and I love very much your designs and also your fabrics. This one of this bag is wonderful, but I don' t find it in anywhere. Where is possible that I can buy it?. Thanks for your attention.